By nature, children are imaginative, creative and full of life and therefore it makes a perfect sense when you see their bedroom filled with entertaining wall décor. With 3D kids murals in the market, it is now easier to transform their bedrooms into a playful environment beyond their dreams. Through one of our kid’s wall murals, you can create something that is truly unique and that a little boy or girl child will love. Cartoon car wall murals are the perfect addition to kid’s bedroom or playground that will encourage their imagination. 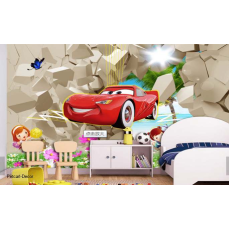 No matter what they enjoy, you will find cartoon car wall mural the best option for their bedroom. These classy kid’s wall murals will transform any boring space into a place your children will enjoy. They are easy to install and you can remove from the wall without putting damages. Searching for a place to buy entertaining wall mural for your children bedroom? Visit Petcarl Décor to buy what you are looking for.